HIV/AIDs is a major issue in Malawi and Mrs Soko of the Primary Health Care (PHC) Department at Livingstonia Hospital is in the forefront of the battle. Every day she see the effects of HIV/AIDs as she provides practical care for families and, particularly, orphaned children. 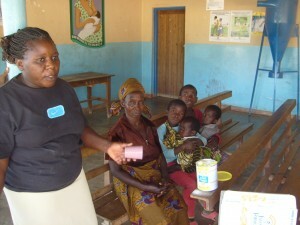 Here she is teaching a ‘Gogo’ (old person) how to make up baby milk for babies that have recently come into her care. PHC wil then give ongoing and appropriate support to this family using donated clothing, goods and financial support.